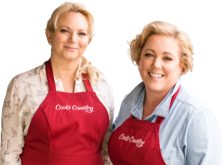 Test cook Christie Morrison makes host Bridget Lancaster the ultimate Grilled Thick-Cut Porterhouse Steaks. Then, equipment expert Adam Ried shows host Julia Collin Davison his top pick for paring knives. Next, tasting expert Jack Bishop challenges Bridget to a tasting of crumbled blue cheese. And finally, test cook Lan Lam makes Julia the best Caesar Green Beans.